MONTREAL, January 15, 2019. 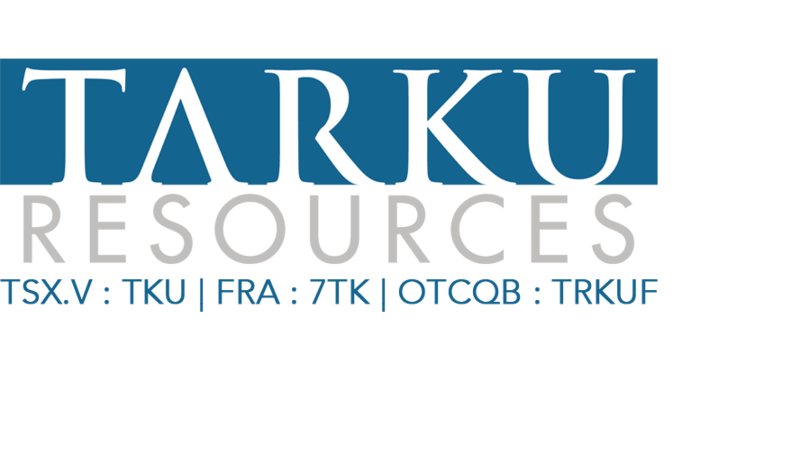 Tarku Resources Ltd. (TSX-V: TKU) (the "Company" or "Tarku") is pleased to announce that it has signed a non-binding letter of intent ("LOI") with prospectors with respect to an option to acquire a 100% interest in the vanadium Lac Fabien project ("Project") in Quebec, Canada. The LOI outlines what would be mutually acceptable principal terms for a definitive option agreement that will have to be signed before February 28, 2019 and under which, subject to certain conditions, Tarku would issue mainly shares and incur exploration expenditures towards an option to purchase a 100% interest in the Project over 4 years. Tarku currently explores its options in order to better secure the financing of the project. Julien Davy, President and CEO of Tarku, stated: "As project generator, we are engaged in exploring and discovering new resources in Quebec. By acquiring this new project, Tarku diversify and strengthen its portfolio with the intention of realizing value for all stakeholders. Our 2019 summer exploration work will tell us, but currently the size and the continuity of the mineralization looks already impressive. It’s an easy to access location and actual known results from grab samples distributed over kilometers suggest potential for a strong viable undiscovered vanadium deposit”. The project which is accessible by road, encompasses 35 mining titles and is located 130 km North West of Quebec City and at only 3km from the Lac St-Jean freight and passengers’ railroad. The Lac Fabien project initially highlighted its potential for magmatic Fe-Ti-V-P mineralization in 2001 (0.58% V2O5, 59.31% Fe2O3; GM 60997). The vanadium-rich magnetite sub vertical beds are hosted in layered mafic-ultramafic intrusions associated with anorthosite. Recent exploration work returned over 25 grab samples containing > 0.25% V2O5 distributed in a 1.2 km by 300 m area. Results include 0.48% V2O5 on a grab sample and 11 m @ 0.22% V2O5 in channel samples. Preliminary results from Davis tube tests showed very good recovery of magnetite concentrate that returned values from 1.37 to 1.67% V2O5 and 55 to 65% Fe. Recent magnetic survey completed by the Quebec government in 2015 demonstrate that the magnetic anomaly associated with the vanadium mineralization extends over 6 km in length. The mineralized area is characterized by thin to no overburden suggesting a potential good stripping ratio in the anticipation of an open-pit exploitation. Tarku is planning to conduct exploration work during summer 2019, including extensive rock sampling, channel sampling and stripping aiming to validate the thickness and continuity of the mineralized vanadium zones as well as the grade distribution. Work will also include preliminary metallurgical testing to demonstrate the recovery quality of the vanadium at the Lac Fabien project. Vanadium is a strategic mineral used as a strengthening alloy for steel and titanium as well as a chemical catalyst. After a series of deadly building collapses, the Standardization Administration for the People’s Republic of China, recently announced a new rebar standard – requiring the use of vanadium (“Rebar” is used to give internal structure to poured concrete). Vanadium prices are surging because there is also increasing use and development in Vanadium redox flow batteries (VRFB) for long duration energy storage point that are quickly becoming the energy storage solution for peak-shaving, load leveling, microgrids, wind and solar, off-grid power supplies, and uninterruptible power supplies. The rally in vanadium prices is accelerating with V2O5 flake recently leaping to $27.50/pound in China, from $5 per pound 2 years ago. There is actualy no primary vanadium production in North America as China, Russia and South Africa produce annually about 77% of total production. Secondary vanadium production exists but is processed from waste materials as petroleum residues, spent catalysts, utility ash, and vanadium-bearing pig iron slag. Tarku sees an opportunity to develop high quality and clean vanadium projects in a safe jurisdiction as Quebec Province. Tarku is an exploration company focused on generating sustainable projects by conducting exploration in areas with strong geologic potential and high levels of social acceptability. Project generation is the foundation of mining development, and Tarku’s vision is to generate exploration projects with excellent potential for mining development for prospective partners or buyers. Tarku has 74,648,797 outstanding shares, of which approximately 70% are owned by insiders and major shareholders. This press release may contain forward-looking statements that are subject to known and unknown risks and uncertainties that could cause actual results and activities to vary materially from targeted results and planning. Such risks and uncertainties include those described in Tarku’s periodic reports including the annual report or in the filings made by Tarku from time to time with securities regulatory authorities.